#1 It’s fast – Skiers longing for waist deep powder and western sunshine can hop a nonstop Delta flights to Salt Lake City, hit the tarmac by 10, and be heading to Park City’s ski areas, Deer Valley and Park City Mountain, just a half-hour drive from the airport. 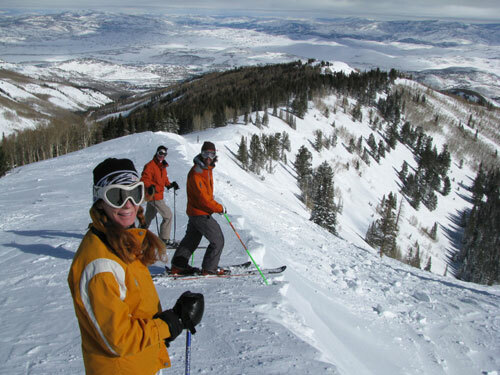 #2 – Your first day in Utah you can be skiing by noon with direct morning flights, Park City’s Canyons is the first resort on your 30-minute drive from Salt Lake City Airport – making it a smart place to start. 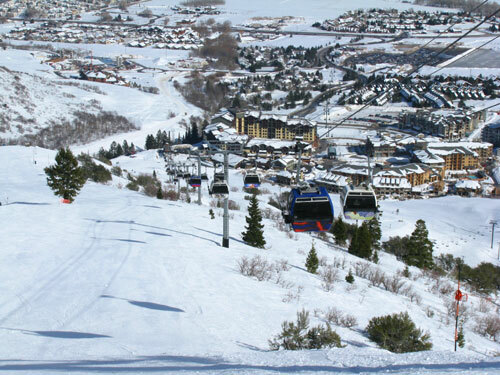 #3 –Park City is the best western ski town because you have tow major ski resorts within minutes of each other. This 1868 silver mining town is now a gold mine for skiers. The funky frontier Main Street brims with historic store fronts, western saloons, just enough boutiques for après ski retail therapy, and an artsy vibe. 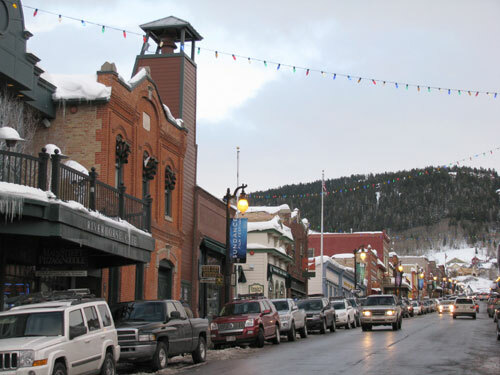 Robert Redford’s Sundance Film Festival (2nd only to Cannes Film Fest) is staged in Park City every January. #4 – “The greatest snow on earth.” They call it the Great Salt Lake Effect when lake water rises into the clouds, producing squalls of light, fluffy and dry snow that dumps on the nearby Wasatch Mountains. This Utah trademarked snow phenomenon causes an epidemic called “powder flu” – highly contagious amongst skiers – causing extended work absences and irrepressible grins. #5 – You must ski Deer Valley before you die. 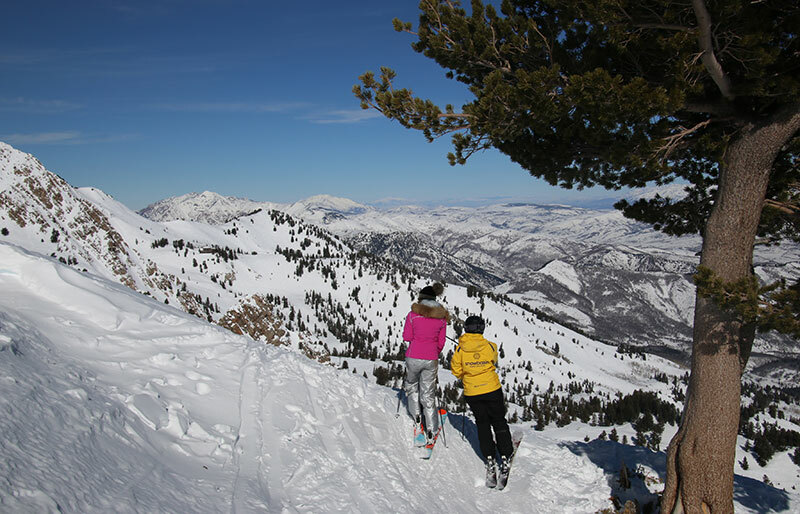 Its one of Utah’s Top Family Ski Resorts, and a #1 rated ski resort by Ski Magazine for service and snow grooming, Deer Valley is a posh, semi-private ski paradise where the service is as sublime as the snow. Snowboarders are banned and lift ticket sales are limited (so buy your Deer Valley tix in advance). Yes, they carry your skis from the car, and groom their slopes to perfection. 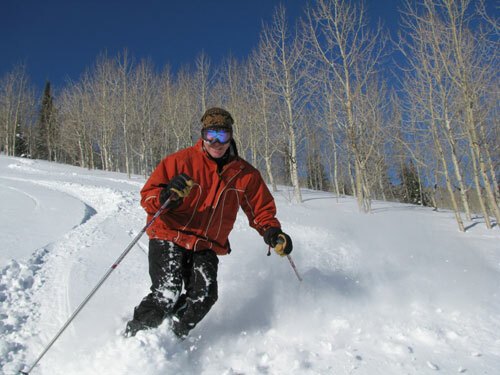 But don’t assume that Deer Valley’s 2,026-acres are all buffed and behaved – Empire Canyon has steep chutes and adventurous aspen glades to rock your otherwise regal resort stay. All this top-notch alpine amusement works up an appetite and Deer Valley’s mountain lodges are elegant environs in which to eat (and drink, and roast your toes by the fire). 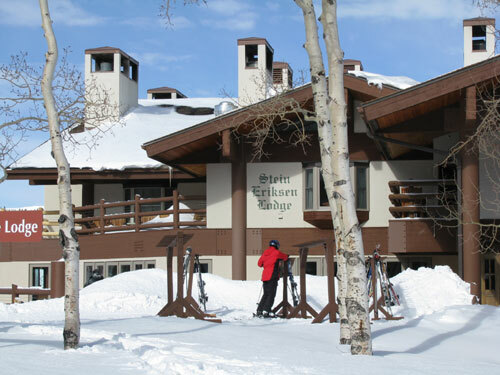 You can also ski to The Goldener Hirsch Inn for an Austrian-inspired feast of fondue, or stop by legendary Stein Eriksen’s Lodge for the après ski “see and be seen” scene. #6 – Park City Mountain Resort is where the US Ski & Snowboard Teams train. You can push your limits here too amid 17 peaks, a dozen bowls and 7,300-acres. 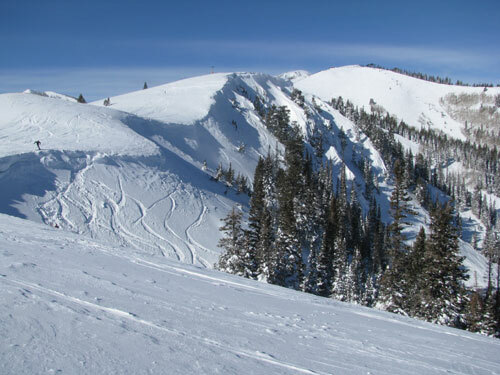 McConkey’s Jupiter Bowl and 9990 offer high-alpine high adventure skiing up to 10,026’. Meanwhile the front sides of Park City and Canyons provide long blue boulevard trails for everyone. Back in 1963 when Park City Ski Area opened skiers would ride 3-mile mine shafts to access the snowy slopes, today you can coast on comfy six passenger quad couches to hit Park City’s signature runs and see the old mine shafts and towers. Park City is now owned by Vail Resorts- part of the Epic Pass. 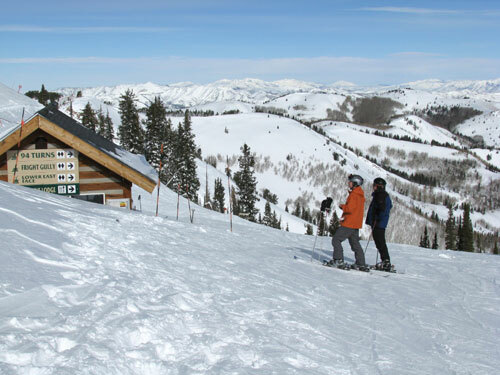 #7 – The Canyons is part of Park City Resort – making it Utah’s largest single ski resort spanning 7,300-acres. 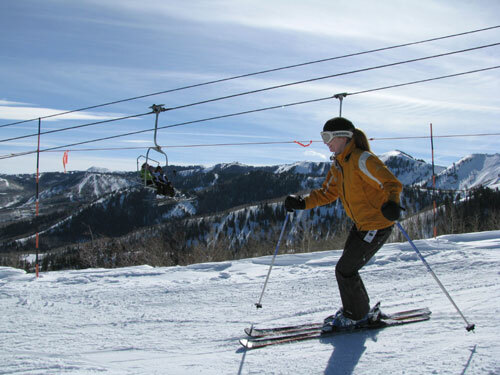 Canyons Village offers a family friendly slopeside village with daily entertainment, and ideal on mountain lodging at the Grand Summit Hotel, West Gate, Silverado, Apex, Hyatt, Westin and Waldorf Astoria – all steps to the lifts. #8 – Cool Runnings! Utah hosted the 2002 Olympics, and you can witness all the winter venues – the moguls and monster jumps at Deer Valley, the Slalom and Superpipe at Park City, even the Nordic 90-meter and the official Torch at Utah Olympic Park. For $200, you can ride the full track four-man Olympic Bobsled in 50-seconds. But when they warn you that this is “an aggressive, violent minute-long ride during which you will pull 5G’s and 80 mph” – that’s no joke and no refunds are given at the conclusion of the ride. This ride is no amusement park thrill – it’s more like being hurtled over the frozen falls of Niagara in a metal trash can. #9 – Deep snow and deep discounts! Keep dialed in to Park City’s Stay & Ski promotions and Ski Utah deals as well. You can book slopeside lodging for two nights at the luxurious Lodges at Deer Valley, the revered Stein Eriksen Lodge, or the Grand Summit at the Canyons, with ski and stay specials like third night free. We recommend the Silver Baron Lodge at Deer Valley – each beautifully appointed unit has its own hot tub on the private deck (I told you Deer Valley does it right! ).